Building a berry maze instead of a field of weeds for the community of South Bristol to enjoy. The design will be created by the children from the local school. This project was funded on 24 Apr 2017! This is an unique project in the UK. 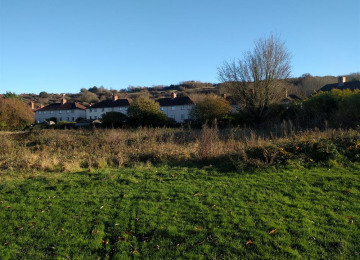 Beside the obvious scope of bringing together the residents by offering a space suitable for children play, organising treasure hunts, harvest day, etc, it could potentially become a tourist attraction, helping a struggling community hit hard by the local council cuts to thrive. Already with two litter-picking events (a third one is on the way on the 11th of March), together with a handful of people, we managed to transform what used to be called "the tip" amongst the residents into a beautiful community space, where people come for a picnic rather than to dump their rubbish. 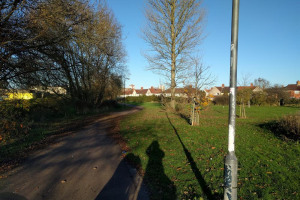 This is also democracy at its best - at the last event, local residents have voted for the best way to improve the park and building a berry maze was almost unanimously chosen. 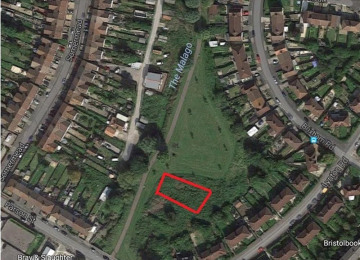 Bristol Parks have agreed to the idea, so now it has come to the point where we need to gather funds for the project. The park is situated in a disadvantaged area of the city, where many people survive on benefits and there is very little community involvement. There is a lot of antisocial behaviour too. We all know that people are less prone to litter when a space is clean (we have had the proof of that in our experience of cleaning the park). Similarly, when a place is beautiful and well kempt, people tend to treat it better and are more likely to be inspired to do good things. We are a small group, but our dreams are big. 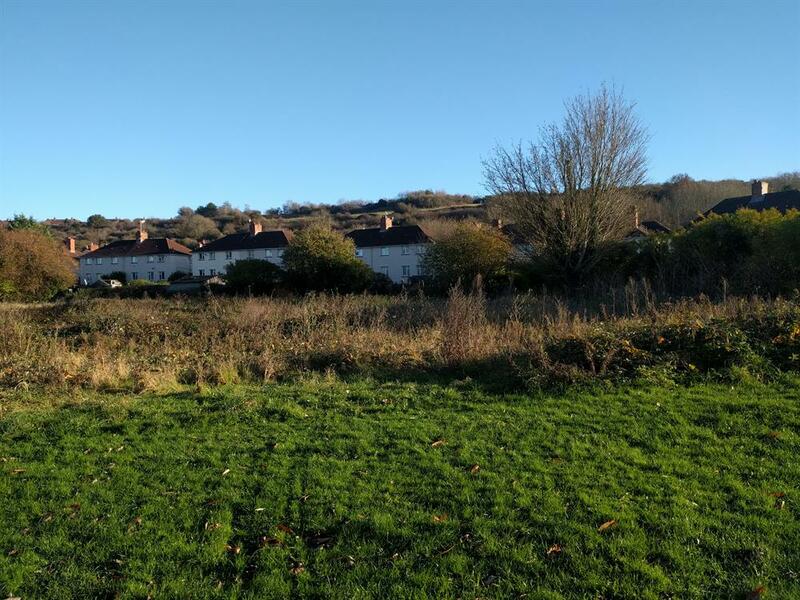 .Brixham Road Open Space is a small open space in South Bristol, a natural paradise which has been fly tipped for years, but it's changing as we speak! 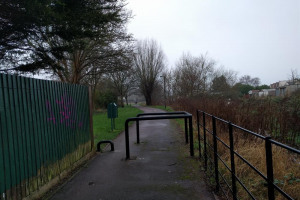 Last year, on a drizzly October morning, during the interminable bus journey that took Raluca, a mother of three under 5’s, from South Bristol to Southmead, a crazy idea came to her mind – wouldn’t it be nice to have lots of berries for the children to forage in the local park, instead of the unsightly patch of weeds? 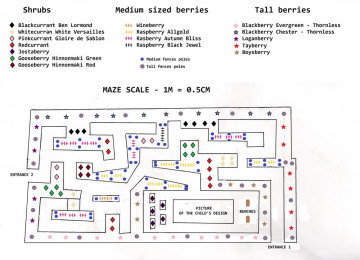 What if the berries would form a maze, to make it more fun? And with that, the incredible adventure of what would become the world’s first berry maze has begun. Raluca was no gardener – in fact, historically, she managed to kill any plant that was left into her care (as she admits) – so had no idea where and how to start this. She went to the local school, Parsons Street Primary School, who had an allotment crew, and had a chat with the gardener working with them. 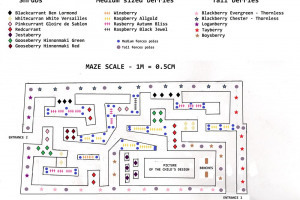 Not long after that he sent her a list of possible berry plants which could make up the maze. 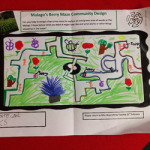 A contest was set up in the school to choose the best drawing of a maze made by Year 4 pupil – and Harry Ward, a 9 year old, won with this beautiful drawing. After extensive talking to a former professional gardener who happened to be one of the volunteers taking care of the park, Barney Smith, Raluca understood that this dream, although doable, would require far more money and effort that she had imagined. What followed was a whole year of intense work: transforming the drawing into a map without actually having the proper measurements, crowd funding for over £4,000 (which was miraculously raised within one month), finding suppliers, researching materials, discussions with the authorities about what could be done and when, trying to find enrol volunteers which would have the skills and time necessary for the project and, finally organising the work sessions. For three months, from the beginning of August until mid October, volunteers have worked almost every Saturday, in the scorching heat and in the pouring rain, to clear up the land and the slabs, prepare it for planting (oh, the endless digging!) , assemble the planters, drive the posts into the ground and mulch (and mulch, and mulch some more). Although tiring work, the sense of community has grown from one session to the other. “When I started this project, I barely knew anyone in the area. Being a mum for three little ones can be quite isolating. Now there’s hardly a day that passes when I don’t bump into one of the volunteers somewhere in the neighbourhood. I’ve also witnessed friendships being formed during this period. Towards the end, it almost felt like family.” says Raluca. On Saturday 18 November the Berry Maze adventure reached the end of a big chapter – the building of the maze – with the planting of 234 bare root canes and bushes of berries. Present on the day were some of the veteran volunteers (with Barney leading the way and helping anyone who wasn’t sure what to do, Jackie coordinating the volunteers and guests and Germinal doing much of the back-breaking work), some new volunteers, amongst them students from UWE and three special guests. The first guest to arrive was Cllr. Jon Wellington, who has been supporting the project all along. “This project was essential [for the area]. When I got here 18 months ago, this area seemed a bit unloved: there was a lot of rubbish, a lot of flytipping. 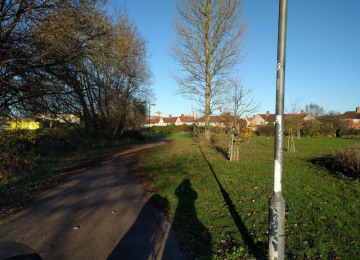 Something like this is not only improving the area, it also brings the community together.” The councillor set to work together with the other volunteers and planted quite a few berries together with Liam, one of the youngest volunteers. A little later Karin Smyth MP arrived. After a short tour of the maze, during which she stopped and talked to almost all the volunteers, Karin planted one of the Jostaberry bushes in the planters built by the Retired Gentlemen Woodworking Group, from Knowle. She said “It was a lovely morning meeting volunteers and seeing how the maze is developing. I understand that a maze made from berrying fruit plants is unique in this area and perhaps in the world. 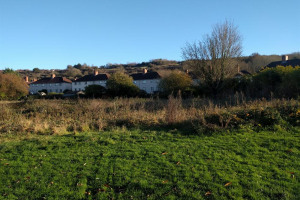 To have that in south Bristol is amazing.” Karin then resumed chatting with her constituents, most of them neighbours of the maze, listening to their suggestions and requests related to the area. Around midday, The Lord Mayor, Cllr Lesley Alexander, has joined the volunteers and, after the honorary tour, planted one of the berries too. It came to light that she is a very good gardener herself, not needing any instructions or help with the planting at all. “I think it’s a lovely idea, it brings the community together. And there’s an outcome at the end of it, which is the fruits!” With so many good people at work, the planting of over 230 berries (perhaps a record in itself) took almost no time at all. All it was left to do was to lay the remaining mulch on the planted plots and water the plants in. As the day ended, you could almost feel a wave of regret as the volunteers who have been working together for so long said their good-byes, knowing that they will not see each other for a few months, while the plants go dormant for the winter. Although not quite ready (the plants will take around two years to reach full size), the impact this project can already be seen. 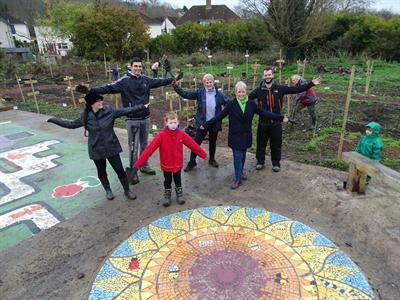 The weeds have disappeared, the concrete slab has been given a new lease to life with its colourful mosaic (donated by the Friends of Parson Street Railway Station) and the huge 8x4m drawing in the middle (painted by local artist Ollie Gillard) and people are already losing themselves in the maze. 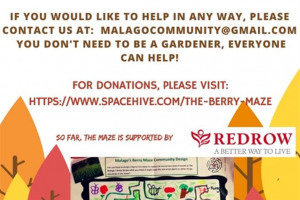 The Berry Maze has even received a prize: The Best Community Venue during Bristol Doors Open Day. Who knows what will come next? This is the last step for delivering our project: planting 234 bare root canes and bushes! It will happen on the 18th of November and everyone is welcome to participate: no need for special gardening talents or experience, we will make sure everything goes smoothly! Small spades and gardening gloves are welcomed, but no need to bring anyrhing else. Hope to see you there! 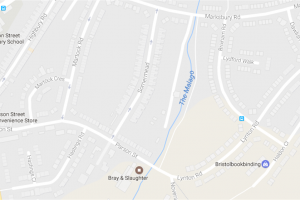 <iframe width="560" height="315" src="https://www.youtube.com/embed/28DljrwWbQY" frameborder="0" allowfullscreen></iframe> The community project designed to put Brixham Road Open Space of South Bristol on the map is getting closer to completion. 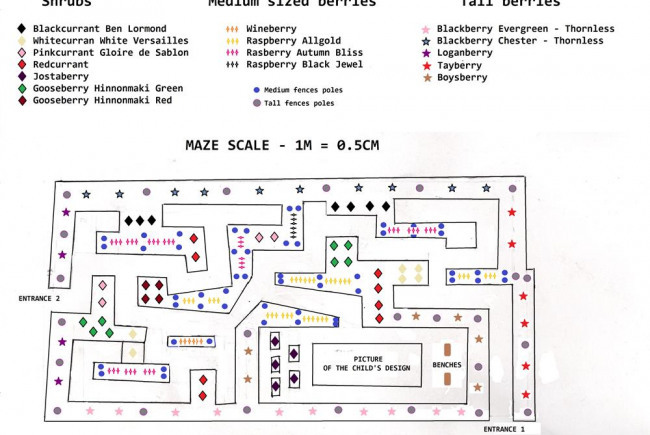 The maze, which will feature 232 berry plants, ranging from blackberries to jostaberries, is now a real 3D maze, not just a nice map and it’s awaiting planting. September has been an extraordinarily busy month, with volunteers working at the maze every Saturday and even some Tuesdays in between. As with every project of this size, the surprises came one after the other (and most of them were not pleasant). After the initial shock of finding a real tip underneath the weeds, which had to be cleared before the Open Doors Day event (how lucky that Good Gym was around to save the day! ), volunteersgot down to the unending task of digging. And they dug… and dug… and dug: shoes, wellies, cassettes, car radios, bricks, knives, forks, cables. As one of the volunteers, Anna, put it: “Anyone thinking of building their own car should apply - we found nearly all the bits you need!”. Meanwhile, the tasks planned beforehand still had to go ahead, so some visible progress could be made: mulch had to be layed on the paths, wooden posts had to be driven down to their place (and they were, thanks to the equipment lent to the project by the National Tool Hire local branch) , planters had to be built and wires set up. The volunteers worked bravely through the most challenging situations (even in the pouring rain), most of the time accompanied by the phenomenal runners from Good Gym. Raluca, the project manager, recalls: “Nearly every weekend the Good Gym came to our rescue – they came for one hour at a time and were given the most difficult tasks, but they’ve done brilliantly! One of the children saw them coming and said ’Here come the superheros!’. I really don’t think he was far off from the truth.” Superheros were also the handful of dedicated volunteers who have been working hours and hours at a time, week after week, sometimes making painfully slow progress. “We are amazingly grateful to have some fantastically dedicated people who volunteer with us: Jackie Smith, Germinal Magro, Barney Smith, Davina Blake, Ben Brooks, Patrick Rainey (and his delightful little boy Tom, who even shared his birthday cake with us) and more recently Duncan Butler with his family, have been attending our work sessions almost every week and worked extremely hard. 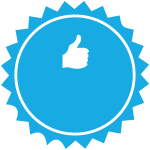 Others, like Emma Lashwood and Gavin Spittlehouse, have come only on one of the sessions but worked extremely hard and made such a huge difference. There are others who have worked really hard and it’s difficult not to mention them all, but we would run out of space. We are planning, however, to make a banner at the end, thanking and naming all the wonderful people who have made a difference to this project and also all the businesses who helped us, be it via in kind donations or help with delivering the maze.” October started with more working sessions, in an attempt to finish everything before the planting – which will take place on the 18th of November. On the 14th of October, local artist Ollie Gillard, aka Gage Graphics, painted on the centre of the slab initial maze map - the winning picture made by 9 years old Harry Ward from Parson Street School. He was joined by Harry himself and a few volunteers and the result is fantastic. With most of the preparatory work now ready, November will be the month when the whole project comes together. And what better way to crown this project than having a very special guest? ”We are very lucky to announce that Karin Smyth MP, our local representative in the Parliament, managed to find some time in her very busy schedule to come round and show her support for this initiative. It will be wonderful to meet her and exchange ideas about how the berry maze can help our area and increase the people sense of ownership of this park.” If you want to join the project for the big planting event, the volunteers will be in Brixham Road Open Space, just between Parson Street and Marksbury Road, between 9 and 16, on the 18th of November, to plant over 230 berry plants in one go and cover the beddings with mulch, in what is set to become a record on its own. The works for building a maze made out of berry plants (16 types of them, that is) have well and truly started. 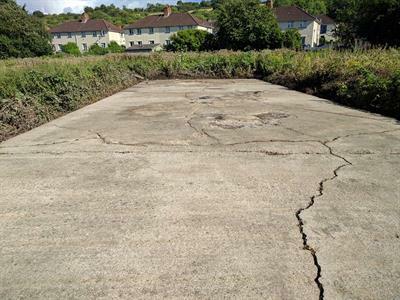 The cement slab has been cleaned up and repaired, the weeds have been mowed and a plough has been brought in to turn the soil and prepare it for planting. With only 6 days to go until the big event where visitors were supposed to be given a taste of the real maze (part of the Bristol Doors Open Days) organisers found themselves in a terrible situation: the plough unearthed a proper tip, with masses of rubble, old car bits and fly tipped items scattered across the 850sqm of land. 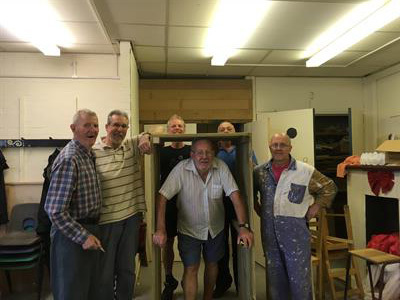 During the week, most of the volunteers are at work, so not many were available to come round and help. And this is where the runners from Good Gym jumped to the rescue. Raluca, the organiser recollects: "We were absolutely desperate! But then I remembered that Paul Becker from Good Gym mentioned that they had a running session on Tuesdays. I messaged him right there and then, and in less than half an hour he confirmed they could help. I could finaly give a sigh of relief!" True to their word, the runners who help people and communities in need arrived at the site around 6.45 and in less than an hour cleared most of the rubble. 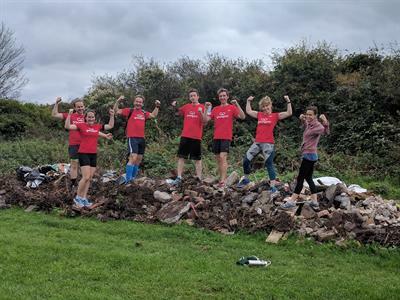 Here is what they say: "Naturally we jumped at the chance to help out - our members love nothing more than to help a project in need - so we headed out along the Malago Greenway and got stuck in moving as many rocks as possible out of the soil and into a pile (..) Everyone worked hard collecting up rubble and rubbish." Germinal, Christine, Jackie and Debbie, the Malago Greenway Project volunteers, completed the job and now everything could go ahead as planned. Despite the awful weather on the days before the event, the Berry Maze volnteers delivered what was promised for Mock'a'Maze Day: the maze real scale model, along wth it's beautiful mini junk model, cakes and games for everyone and an amazing reproduction of Harry's (the child who designed the maze) drawing at a whooping 8x4m, courtesy of Ollie Gillard, the local artist who volunteered his time for the project and the lovely children from Victoria Park Primary School. Harry visited the maze for the first time loved every bit of it (as you can see from the photo!). The day was a success and visitors arrived from all over Bristol to find out what the maze will look like. 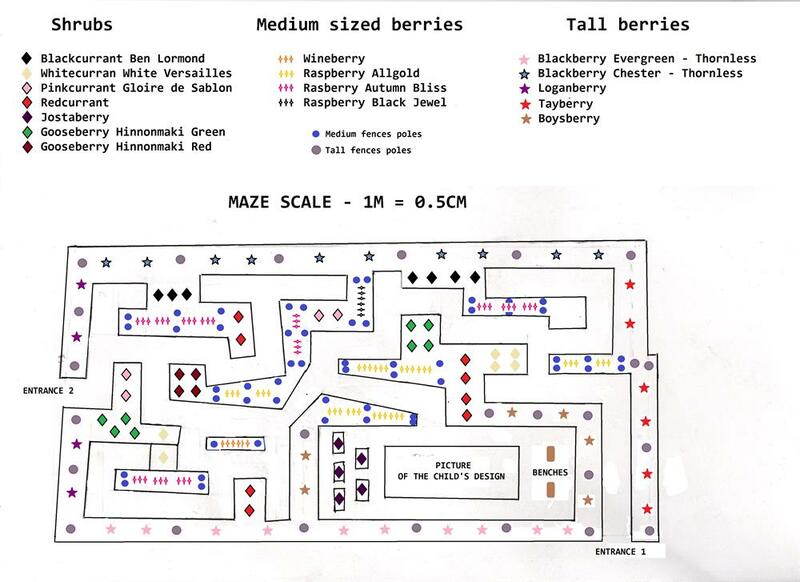 Children were both amuzed and confused and had lots of fun recognising berries from the photos around the maze. Help arrived also in the shape of a donation of wire cutters from the local business Bell Tools, perfect for building the structure of the maze. Works will continue throughout September, when virtually every Saturday between 9 and 4 there is something "cooking" at the Berry Maze - bramble root pulling and laying mulch on the paths on the 16th, structure building on the 23rd and the 30th. 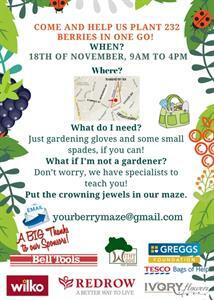 The project works will culminate with the berries being planted, on the 18th of November. There will be special guests that day and all hands will be needed on deck - approximatively 260 bare root canes will be planted in the same time (must be a record in itself!) 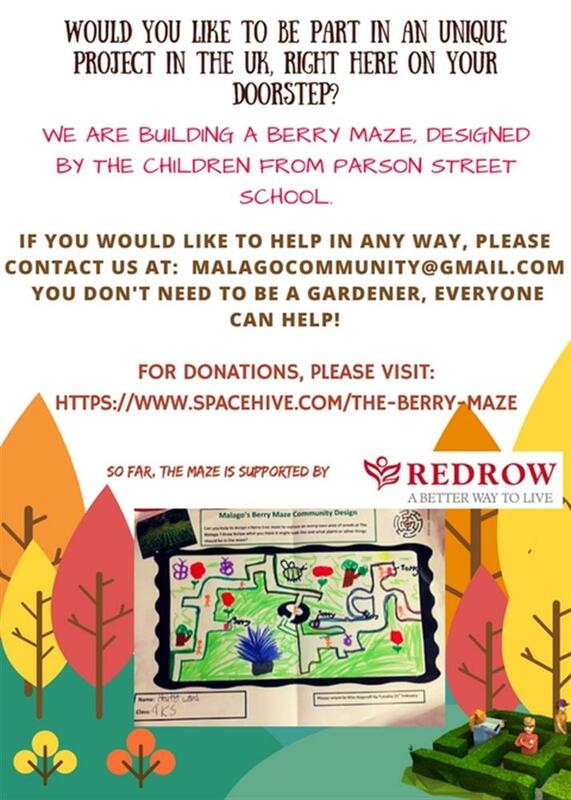 There might be changes of schedule and there is a possibility that the permanent painting of the central slab will be done in October, so if you'd like to participate, keep in touch with the organisers via www.facebook.com/TheBerryMaze2017 or yourberrymaze@gmail.com. We're now well on our way to repairing the concrete slab which will be the heart of our maze. Things didn't go as planned with this part of the project, as the slab was a lot more damaged than expected. 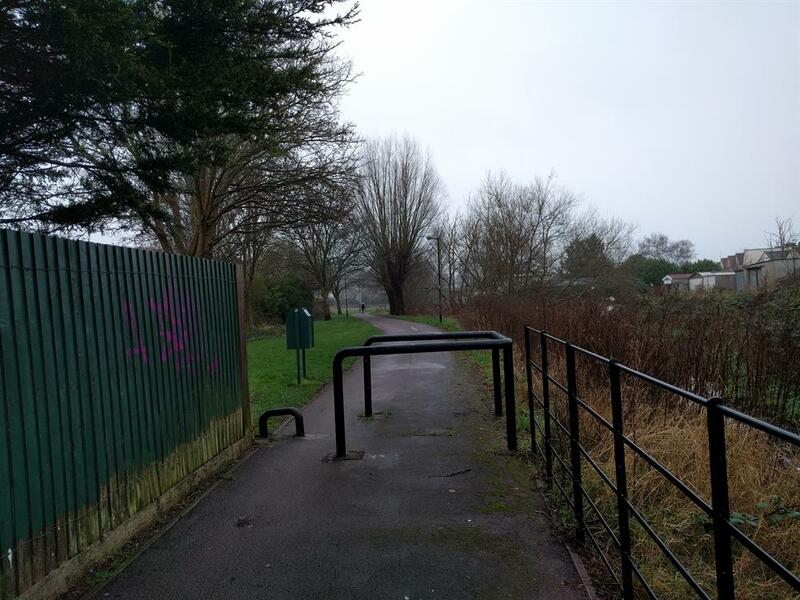 However, with the work and dedication of our volunteers and the help of our contractors, Archway, we have managed to make some significant progress. 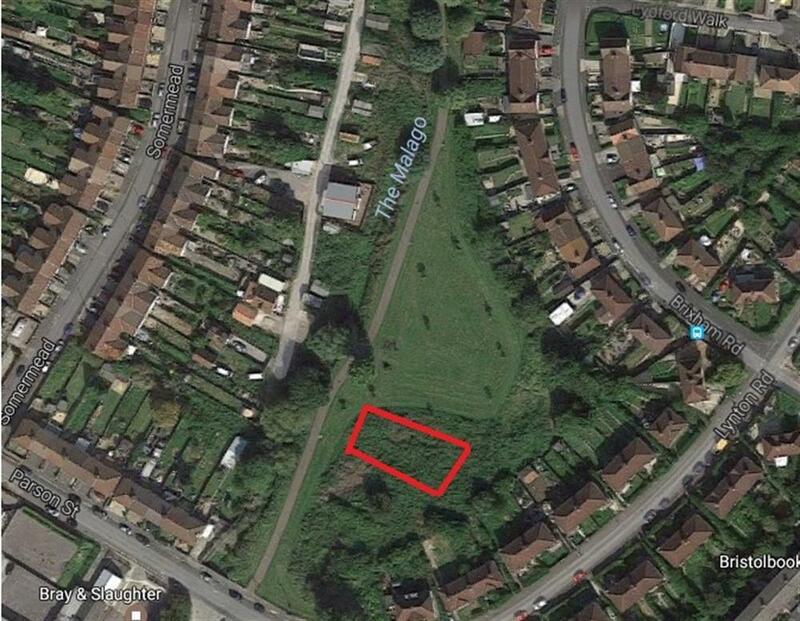 Here, you can watch how we cleared out the brambles and weeds from the cement slab on the 5th of August. https://youtu.be/-p82X_b6D8U We then proceeded to jet wash it - and this is where Archway has helped greatly, by lending us the tools to do it. It was hard work - the volunteers have spent all day in the scorching sun clearing it up. You can see in the picture the difference we've made! 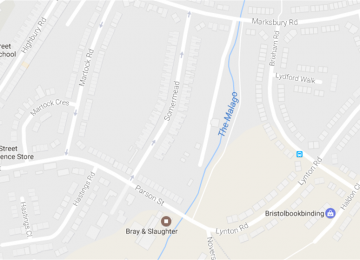 Next, this Friday, we will work side by side with Archway - they will repair the cracks in the concrete and we will build a wooden border to the bits of the concrete that are too difficult to repair, where the planters will eventually be set. Next Tuesday, we will procede with overlaying the concrete with a special material which will give it a smooth surface. However, because of the prohibitive cost of the material, we will have to do this only where the painting will be, a 8x4m rectangle in the middle of the slab. Then, on the 2nd of September, we will complete the renovation of the slab by adding the gravel within the borders where the planters will be. The benches and the mosaic kindly donated by Friends of Parson Street Railway Station will be added to the site at another date - we will keep you informed when we know the details. Also, on the 2nd of September there will be a lovely litter picking event to clean out the newly mowed and ploughed space where the maze will lay. We are truly well on our way to building the Berry Maze! Networking - the more people hear about the project, the more chances there are to get volunteers and funding. So if you're good at spreading the word via internet or in person, let me know and I'll send you all the info that I have. Muscle power & non specific talents - from measuring & doing the markings for the structure, to laying ornamental bark on the paths or simply pushing a wheelbarrow, there will be plenty of things to do under this umbrella. Gardening skills a. when we build the maze - there will be various days, but it will be quite short and intense b. Maintenance - less intense (just watering, when & if necessary, training the plants & pruning once a year), but more committed. Drawing/decorating - for the planters, benches & the childs design on the concrete slab. Building skills - the concrete slab might need a bit of a repair and tools may be needed for various other odd jobs on or off site. We are delighted to offer you a variety of gardening tools to help maintain the Berry Maze and keep it looking in top form. My name is Raluca and I have a background in PR and event organising. 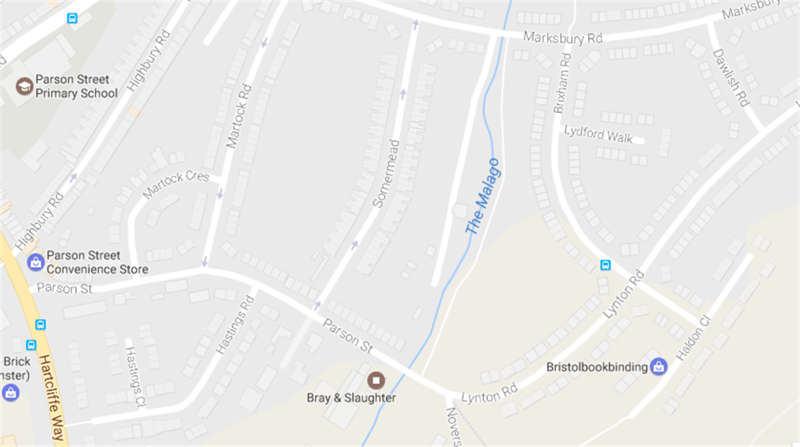 Since June last year I have taken an interest in the a little park called Brixham Road Open Space. I am pleased to say that with two litter-picking events (a third one is on the way on the 11th of March), together with a handful of people, we managed to transform what used to be called "the tip" amongst the residents into a beautiful community space, where people come for a picnic rather than to dump their rubbish. 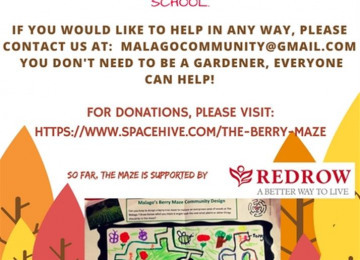 At the last event, local residents have voted for the best way to improve the park - the project that they loved most was building a berry maze together with the local school, for the benefit of everyone in the area. 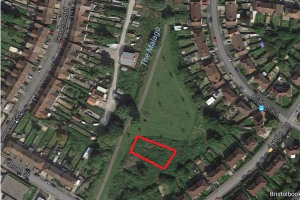 Bristol Parks have agreed to the idea, so now it has come to the point where we need to gather funds for the project. 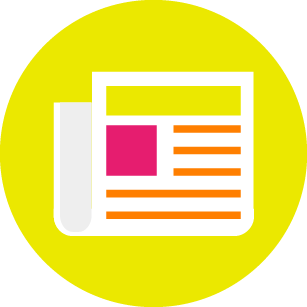 Project Delivery Manager: Raluca McKett The Project Delivery Manager takes legal responsibility for receiving and spending the funds raised and ensuring the project is delivered. Contractor: George Vauden The team responsible for building or installing the project.